The first Monday of September often spells the end of the summer for Canadians. Sept. 2, or Labour Day as it's better known, isn't the official end to the season. That technically falls on Sept. 22, but for whatever reason, Labour Day always feels like the bookmark to everyone's chapter of fun in the sun. While many Canadians now use the long weekend to squeeze in one last camping trip or to relax by the cottage, Labour Day's origins date back to the 1880's as a fight over work. Well, it was more of a fight to work less and for a more balanced work day but now it's remembered as a statutory holiday across all of Canada. For some, that means plenty of closed stores and the inevitable boredom of being stuck in a city during a long weekend. The good news is that while government offices and liquor stores will be closed in most provinces, restaurants and plenty of tourist attractions will remain open. And for those not crossing the border to the U.S., there's still find plenty of good old-fashioned Canadian fun. 7 Ways To Have Some Canadian Fun On Labour Day. Traditionally, Canadians celebrate Sept. 2nd with fireworks, parades and picnics, but if you're looking for something different, why not try your hand with a trip to the Canadian National Exhibition in Toronto? The CNE or "The Ex" is already well underway but features the Canadian International Air Show during the Labour Day long weekend. The show is free with admission to the CNE and stars performances by CF-18 Hornets, Snowbirds, and Trojan Horsemen — just to name a few. Learn more about the CIAS. If you have to ask yourself one question on Labour Day, let it be this: Are you ready for some football? It's no NFL Sunday but the CFL's Labour Day Classic is a September long-weekend staple for many fans. The matches typically pit long-standing rivals, like the Hamilton Ticats against the Toronto Argos, but due to scheduling issues there'll only be two matches during the weekend instead of six. This year, the Winnipeg Blue Bombers head deep into Regina to square off against the Saskatchewan Roughriders on Saturday at Mosaic Stadium. Attend and it'll be a good way to use up any leftover watermelon you didn't finish earlier in the summer. If you're an Edmonton Eskimos or Calgary Stampeders fan, then head to Calgary's McMahon Stadium to watch the match on Monday. If you're tired of hour-long waits for brunch (read: breakfast foods you can make at home but that you're eating past noon) in Montreal, make a trip to the Saint-Lawrence Valley Historical Society's Ecomuseum Zoo. Located on the Island of Montreal's western tip, the zoo-museum hybrid is about a 30-minute drive from the city and features a breakfast with the otter exhibit. There's a continental breakfast for guests but the main attraction comes from visitors preparing and feeding the zoo's northern river otters. The event runs only on Saturday, Aug. 31 but there are other attractions and exhibits that run during the long weekend. Tired of your friends calling you a landlubber? Then earn your sea legs at the Victoria Classic Boat Festival at the Inner Harbour. The event typically draws around 100 classic sail and power boats from the Pacific Coast, making it one of the West Coast's most celebrated boating festivals. The festival starts on Friday and features silent auctions, rowing demonstrations and races open to all who are interested. Think of Fort McMurray, Alta, and you'll probably think of oil sands and dirty rigs. 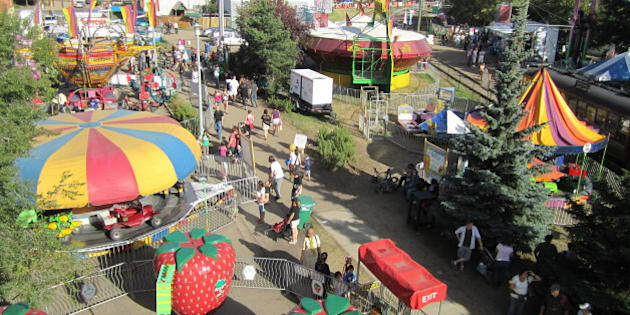 Well, here's one carnival that might just change your perception of Fort Mac. Pegged as the "world's first green carnival," Sustainival promotes a green future where sustainable food, energy and waste solutions are part of the norm. The carnival takes this concepts and combines it with their midway for 20 rides that all run on renewable energy. There also bouncy castles carnival games and other attractions for the little ones. It all goes down at MacDonald Island Park from Aug. 30 to Sept. 2. What started as a small gathering of motorcycle enthusiasts has grown into a rally of over 30 events in Digby, Nova Scotia. There'll be demo rides from Honda and Harley Davidson for newcomers and motorcycle veterans alike. There are also six different runs and tours for anyone looking to take their own motorcycle for a spin. And even if you've never ridden a chopper in your life, there's still plenty to see and do with parades, bands and motorcycle stunts scattered across the five-day festival. Following the success of Toronto and Vancouver's Pride Festivals, comes Quebec City's Pride Festival, or Arc en Ciel Day Quebec. The five-day festival kicks off on Thursday, Aug. 29, runs till Monday, Sept. 2 and is packed with performances by drag queens, live DJs and music and movie screenings all in the name of celebrating Quebec's LGBT community. Highlights include a singing competitor, a drag queen faceoff and a live show by female impersonators. It's one of Canada's most iconic tourist attractions and it's gearing up for a busy Labour Day weekend. Niagara Falls typically draws in plenty of visitors each weekend thanks to its majestic falls and family-friendly atmosphere. That and having a casino can't ever hurt. But if you're looking to spend your money rather than gamble it away, the city's Buskerfest will run from Aug. 30 to Sept. 1. The event looks to bring 50 performances from around the world in an effort support arts programming for kids and youth. The Falls also brings the fireworks during the Labour Day long weekend with the 20th anniversary of Canada's longest running fireworks series. So, how will you be spending your Labour Day long weekend? Let us know on Twitter @HPCaTravel or in the comment section below.